It’s the beginning of the end for Citi Bike’s software troubles. After operating for nearly two years with software that drove bike-share users nuts, Motivate, the company that runs Citi Bike, says it has replaced its back-end with a better platform that will lay the foundation for major improvements in reliability and convenience. Citi Bike shut down abruptly over the weekend to switch out the system’s software, Motivate chief Jay Walder said this morning. 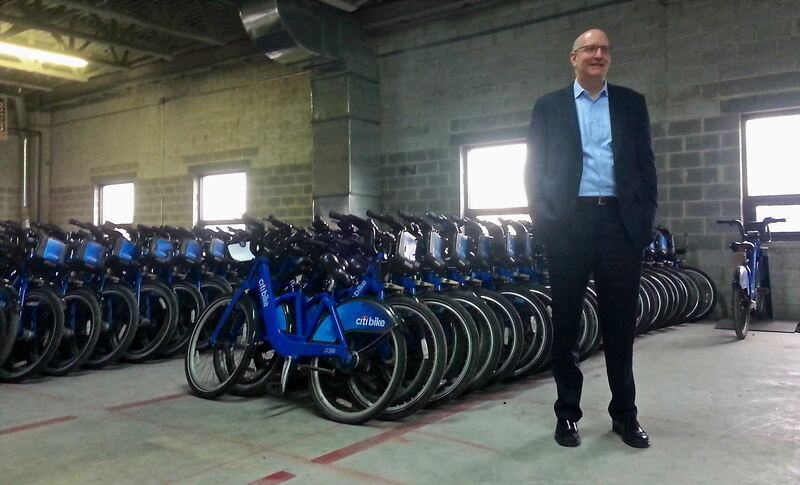 In place of the problematic back-end supplied by PBSC Urban Systems, Citi Bike now runs on software from 8D Technologies, the firm that developed the successful plumbing behind bike-share systems in other cities. The weekend work wrapped ahead of schedule on Saturday evening. The most immediate improvement will be stations that stay online consistently. Walder said that at any given time over the past winter, 20 of the system’s 332 stations shut down after failing to hold a charge and burning through their solar-powered batteries. Today, all 332 stations are operating, Walder said, except for the six that have been removed for road construction or utility work. Reliable confirmation when a customer successfully docks a bike, including more accurate green lights. Users will also be able to receive email notifications when a bike is returned, so they don’t have to worry about unintentional overage charges. When a customer presses a “wrench” button at the dock to indicate that a bike is broken, Citi Bike will send an email asking what is broken on the bike. This allows customers to offer more input and helps speed up the repair process in the warehouse. Allowing customers who purchase daily, weekly, or annual passes to have a key fob or card dispensed to them instantly at some of the system’s busier stations, instead of relying on access codes or waiting for a fob in the mail. Citi Bike plans on adding more valet services so customers at busy stations will be able to return bikes even if the docks are full. The company is also adding more satellite locations where it can store bikes, including Long Island City and near the Port Authority Bus Terminal, to more quickly rebalance the system. Fixing the system’s software became job number one soon after Citi Bike’s parent company, then known as Alta Bicycle Share, was purchased last year by a team of investors who brought in Walder and rechristened the company as Motivate. “We have a commitment to fundamental change in Citi Bike. We had to replace the software to be able to do that,” Walder said. “There were huge holes in the company… This is a technology-based company that didn’t have anyone to work on technology.” One of Walder’s first acts as CEO was to hire Michael Frumin, who began developing Bus Time while Walder was at the MTA, to head up technology. The company has also added staff to improve product development, shore up its supply chain, and beef up its marketing department. Citi Bike took a very circuitous path to get its technology platform back on track. Older systems in Montreal and Washington were developed by PBSC, which focused primarily on hardware, in partnership with 8D Technologies, which focused on software. After a messy corporate divorce right when Citi Bike was supposed to launch, PBSC had new software developed. Its shortcomings left users frustrated and strained the resources of the system’s operator, Alta Bicycle Share. Of the bikes that are on the road today, Walder said 4,253 have received maintenance overhauls, with the full fleet of 6,000 to receive repairs before the summer. Walder said contract negotiations with TWU Local 100, which represents workers at Citi Bike, are ongoing. The system will expand from its current 332 stations and 6,000 bikes to to over 700 stations and 12,000 bikes by the end of 2017. Walder said the first 92 stations will be installed in parts of Brooklyn and Queens by the end of this year. Good stuff. Keep those docks working, Walder! While improvements are good, it shows the company lacks the most basic of customer service sense. Spring: They wait until the nicest weekend of the year to shut down the entire system, on a weekend, with 5 hours notice. I was hoping the reason was something like this. I am incredibly excited and look forward to seeing what effect this has next time I hope on a CB. Wait, were we in a different New York? When they announced the system was shutting down it was freezing and snowing… and then they got it back online way ahead of schedule. I think they executed this perfectly to minimize disruption in an important component of transportation. I’m very happy to hear that now it’s possible to send them more than one bit of information about the state of a bike. On a related topic, I sometimes wonder whether a given malfunction is “wrench-worthy”. I haven’t seen any clear guidelines. Thanks for this post, but considering Citi Bike’s / Motivate’s credibility, I suggest you take their claims for a test ride. Speaking for myself, I never received the last-minute email Citi Bike / Motivate claims to have sent late Friday afternoon with notice of the system-wide shutdown. Monday morning (today), securely docking a bike still resulted in a red light, though when I subsequently checked the website, that trip showed up as completed. Dock-blocking continues. Many docks fail to release bikes; others fail to accept bikes. Monday morning, I observed at least one station (W 4th St and 7th Av South) completely dead. “Completely dead”: other customers were unable to release or dock bikes, and the kiosk screen was blank. I actively use Citi Bike – 859 trips and counting – despite docks that have failed to work properly since Day One. The folks with whom I speak when I call customer service are invariably pleasant, but the best customer service is no need for customer service. Repeating: take Citi Bike’s / Motivate’s claims for a test ride. I trust until trust is breached. Citi Bike / Motivate has a steep climb in front of it to rebuild the breached trust of their customers. Well, that’s depressing to hear. I’m sorry you don’t have brighter experiences to share. Citi Bike was down for less than 24-hours, but they still honored their promise to extend annual memberships by 3 days and offered refunds to 7-day pass holders. Sounds like good customer service sense to me. The weather on Saturday was terrible. It was the perfect time to do this kind of system-wide maintenance. A small price to pay for what promises to be a friendlier user experience that will arguably end disruptions and problems that inconvenienced people far more than a short shutdown did. There are two immediate changes — more accurate info in the app, and no more power outages at stations. I did a spot check of the app at the station outside our office, and it showed the correct number of available bikes/docks. As Stephen reported, the other stuff will be implemented before the summer but it’s not in place yet. FWIW, I did get the email, but my email provider helpfully filtered it as a “promotional email”, so I didn’t see it until I went digging for it. I too had a bad experience this weekend, post update. Sunday, Pier 11, after a ferry ride, I tried 10 different bikes; none of them would release. Another user docked her bike, and then immediately tried to release another one, could not get any to release. Sounds like an issue related to the update process — some stations were brought back online before others. To be fair, it’s been freezing and snowing all winter and this weekend was pretty nice in that context given that it wasn’t so cold your face hurt and there was some sunshine. I still don’t understand the glacial pace of bike and station rollouts. We were originally supposed to have 10,000 bikes in 2012 and now they are saying we can go from 6,000 to 12,000 over the next TWO YEARS! To be a true success, they really have to cover more neighborhoods sooner. They especially need to expand into less wealthy areas like Upper Manhattan to show that Citibike appeals to all New Yorkers. It’s because the capital costs don’t have a sponsor. Citibank and Goldman Sachs provided it for the first roll out. Have to admit I gave up on Citi Bike last year. It was just problem after problem, day after day. Here’s hoping this will really improve things. I want to be a strong supporter but last year I just couldn’t take it anymore. I got an email telling me the system would be closing for the weekend at 10PM. That email arrived at 10:02PM. Good job! Takes longer. Costs more. Welcome to every project ever. Hurricane Sandy really sabotaged the operation initially. Why not make re-position rides free or even pay people something in the range of $0.25 – $1.00? i bet they pay a fortune for a truck to move six bikes, when there are people with low marginal value of time looking for a lark.
? I don’t know much about the back end (aside from reading the JSON feeds) or the hardware, but I do know that PBSC’s CycleFinder app doesn’t work very well either. I’ve been using 8D’s SpotCycle app, even in cities using the PBSC back end. NYC has a specific Citi Bike-branded app, and I’m not sure who wrote that, but other cities are still promoting CycleFinder. There’s also the issue that the Montreal company that manufactures the bikes filed for bankruptcy and now has a new owner. It’s unclear if production has restarted/where the hardware might be coming from. I think his comments about a “new bicycle” sheds some light on that. That’s also perhaps the biggest news in this report…. I don’t speak for Citi Bike, but my guideline is if I wouldn’t want to ride a bike in its current condition, I push the wrench. the brakes on my bike worked but were not very good. I forgot to wrench it. I meant to do it. The system doesn’t really work if single rides or day-passes are cheap. An annual pass is a bargain right now. citibike is near projects in every neighborhood its in. expansion is the goal, but it’s not like they skipped blocks where poorer people live. Oh my god. That would be amazing crowdsourcing, like Google Opinion Rewards. I would totally do that for exercise.